This page defines global SIP configuration parameters. 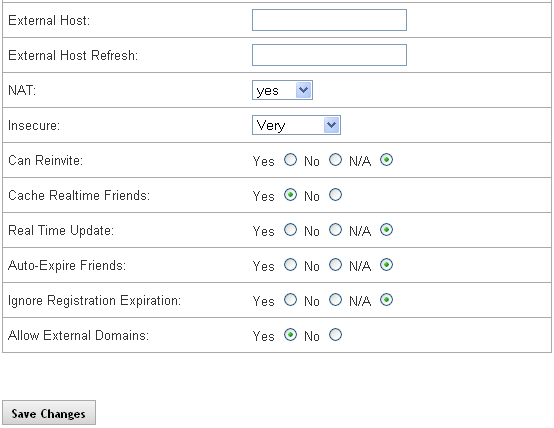 The PBX automatically includes its own localnet if the setting below is set to yes. 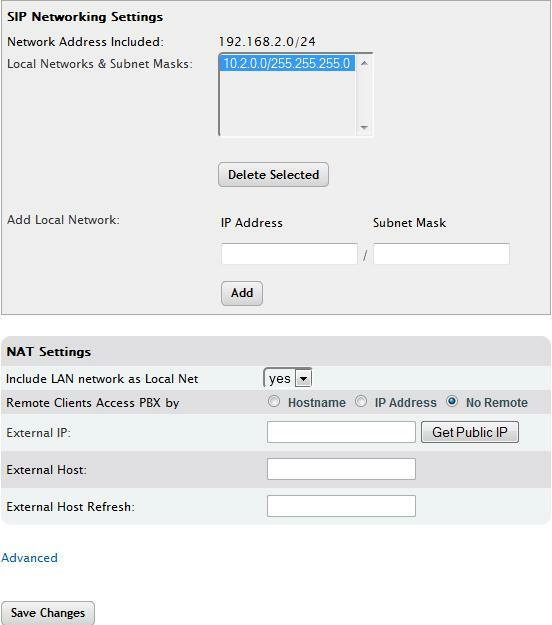 This is where you can add additional IP address to the local network and associated subnet masks. Allows you to delete the item selected from list of networks. Allows you to add local network information. This information will appear in the list of networks. When set to Yes, the PBX will automatically include its own localnet. Defines how Remote Clients (remote phones or SIP providers) access the PBX. Set to No Remote if neither is being used. 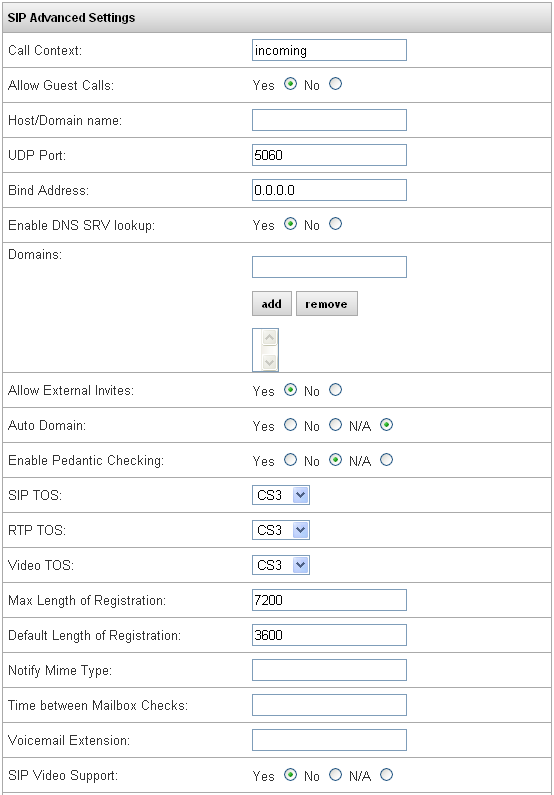 Set to IP address if the site has a static IP or set to Hostname if the site uses a dynamic IP. To work, they will need a Dyndns.com domain, and enter that as the External Host. Used if Remote Clients Acccess PBX By is set to Hostname. Enter the dyndns.com domain that resolves to the current dynamic IP of the system here. Used if Remote Clients Access PBX By is set to Hostname. This is the internval which the PBX will check for an up to date IP. Set this to a value within the internval set at dyndns, typically between 300 and 3000. From the PBX Setup->SIP page, locate the SIP Networking Settings section. Enter the IP Address and Subnet Mask for the network the PBX is being installed on. Highlight the listing you wish to delete. You can use Shift/Ctrl click functionality to select multiple listings. IMPORTANT: The default settings for the SIP configuration should not require any changes. If it is necessary for you to do so to meet your customer’s business requirements, we recommend that you contact IPitomy’s Technical Support for assistance. Sends RTP packet when none received on active call for X seconds, 0 for disabled, which is the default. Default is BLANK. Set to a value, in seconds, if you wish the PBX to end a call when no RTP traffic is detected for that long. Typically used in regards to lines that are not disconnecting correctly. From the PBX Setup->SIP page, click on the Advanced link. The Advanced SIP Networking Settings page is displayed. 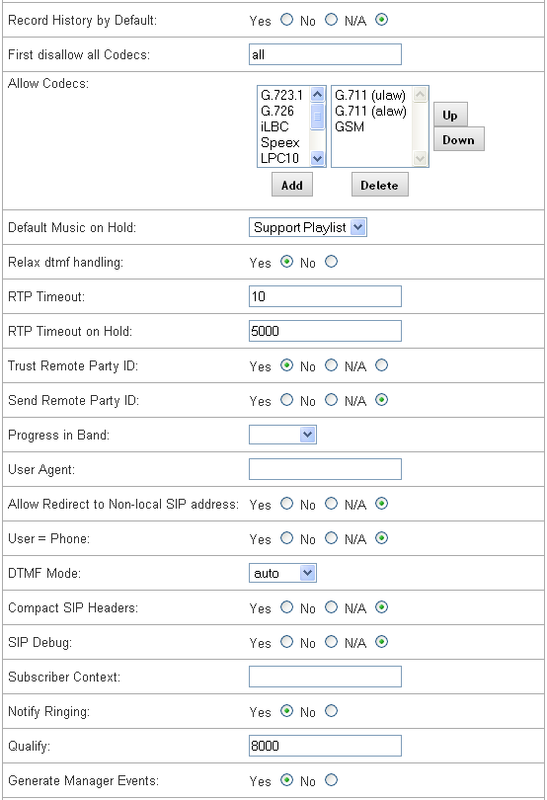 Set the SIP Network parameters base on your business requirements or what is recommended by IPitomy. The default settings should not require any changes. If it is necessary for you to do so to meet your customer’s business requirements, we recommend that you contact IPitomy’s Technical Support for assistance..